Beer Revolution has been part of the downtown Oakland craft beer scene since February, 2010. As both a bottle shop and craft beer bar, Beer Rev offers 47 taps with a rotating draft selection. Alternatively, you can crack open a beer from their cooler to share with friends and decide if you want to buy more to take home with you. Much like City Beer Store in San Francisco, Beer Revolution is designed as a venue in which to discover new beers, share old favorites with friends and talk about the beers with other craft beer lovers… then take home a bottle or so. 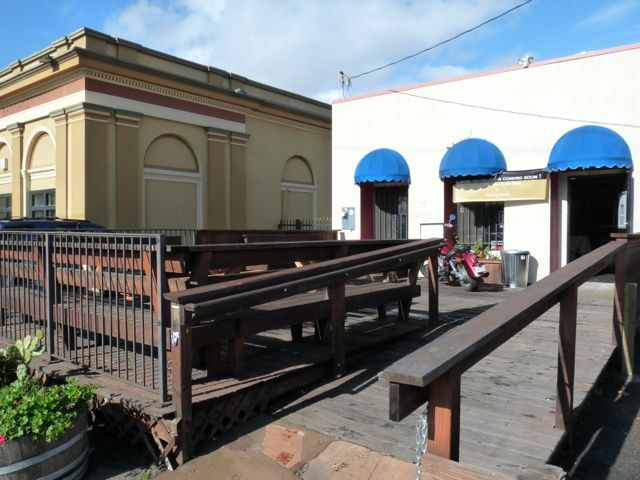 There’s a large deck out front for outdoor sipping in the plentiful East Bay sun. Extras: Located near historic Jack London Square, you’ll find many food and entertainment options to pair with your beer experience. Beer Rev is located about 6 blocks from Rosamunde Sausage Grill and The Trappist for an easy mini-beer tour between Beer Rev and downtown Oakland. It’s also an easy walk to nearby breweries and down to the Jack London ferry terminal, with runs to SF except in the winter months. Get off at 12th St. Oakland. Exit BART thru Exit A1. Walk down Broadway, under the freeway to 3rd Street. Turn right and you’re there. There is also the #72 AC Transit Bus and a free shuttle bus that both run along Broadway. The free shuttle stops in front of the Marriot Hotel and will take you to Broadway and 3rd Street. Verify times, since the schedule changes. This is a great, casual beer bar with friendly staff. It looks like a dive bar inside, “decorated” with beer ads and things made from tap handles. The beer is outstanding though and you will feel at home as Jade says. You can sit outside on long tables or inside and there are board games.